In its flood of Flight 370 coverage, CNN has resorted to a wide variety of storytelling tactics, but for a network known for its technical gimmickry of holograms and “Magic Wall” — some of its latest toys have been a little low tech. The network, which has already resorted to using toy planes to cover the missing jet, rolled out a new feature — a giant floor decal featuring a map of the Indian ocean. The map was installed on the floor for the “New Day” studio. 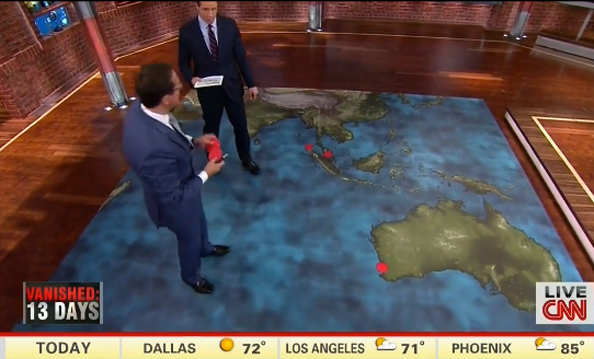 Anchor Chris Cuomo and correspondent Richard Quest walked over the map, pointing to red dots on the map. Earlier this month, CNN used a tabletop printed map in its Washington, D.C. studio for its coverage of Ukraine.